As technology evolves, so do the way people earn money. For this reason, some of the things that kept our great-great-grandparents busy have slowly disappeared or transformed into their modern-day counterparts. Let’s pay tribute to these fascinating old-timey jobs and the equally fascinating stories that led to their demise. 4. Grabador ng Plato’t Baso (Tableware engraver). 6. Lechero (Milkmaid or Milkmen). 7. Limpia Botas (Shoeshine boys). 8. Apuntador ng sarswela (Zarzuela prompter). 9. Lagarista (Film Reel Courier). BONUS Trivia: Disappearing Pinoy Jobs. Long before the jeepneys, buses, and Manila’s Light Rail Transit (LRT) joined forces to provide us with a horrendous mass transportation system, our ancestors relied on the good ol’ tranvia. 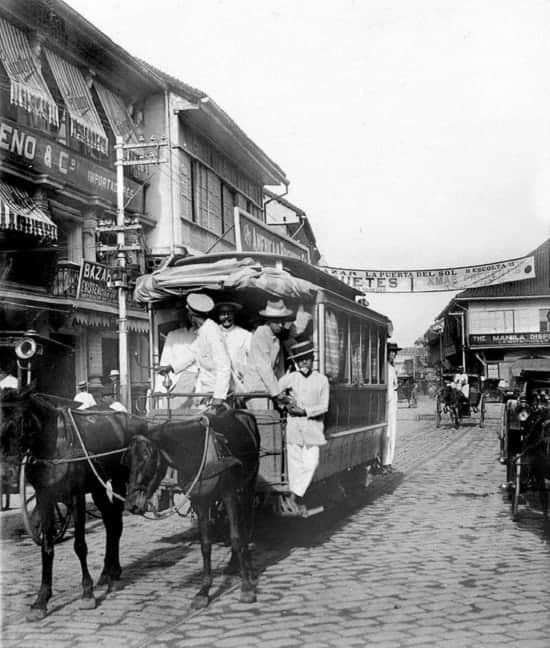 It was first introduced to Manila when the Compañía de los Tranvías de Filipinas, owned by Jacobo Zóbel Zangróniz and his partners, was given the right to operate the first tramcar service in the city capital. These horse-pulled tranvias could accommodate 12 to 14 people, all evenly distributed on both sides to avoid the streetcar from toppling over. Unlike the tranvias in European countries, those we had here were “very casual in operation,” as a visitor once remarked. And by “casual,” he was most likely referring to instances when passengers had to get off and help push the vehicle towards ramps. The quality of the service depended on the health of the horse and the professionalism of the horse tram driver. An “open” type of horse-drawn tramcar. Photo Credit: Eduardo de Leon via Flickr. Made of steel and wood, the horse trams operated in five city routes, with Plaza San Gabriel (present-day Plaza Cervantes) as its central station. Drivers were hired by the company to operate two types of horse-drawn tranvia: the open tramcars equipped with curtains that could be adjusted to alleviate summer heat and the closed tramcars designed to shield the passengers during the rainy season. During the American Occupation, the Compañía was absorbed by the Manila Electric Railway and Light Company (MERALCO) which got the franchise for the first electric streetcar system in the country. After reaching its peak in the 1920s, Manila’s streetcars were wiped out during WWII. Jeepneys and buses soon proliferated the city, serving as Manila’s main modes of transportation until the construction of the first LRT system in the 1980s. In 19th century Philippines, streets in Manila—like those in Sta. Cruz district– were illuminated by lamp posts that were lit using kerosene. 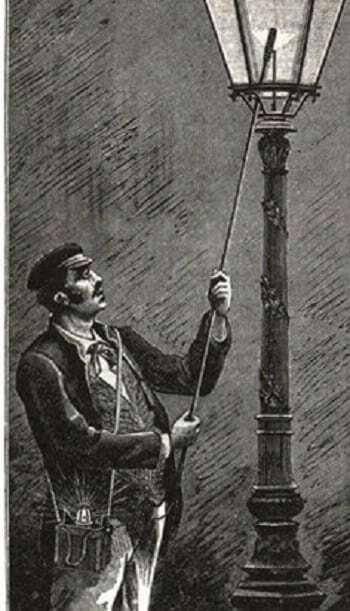 Every twilight, faroleros or lamplighters employed by the city government would go about the streets with their collapsible “bangko-lobo” (“lobo,” a corruption of “globo,” spherical glass dome lamps) to light the wicks of the lamp. Faroleros were also paid to maintain the street lights. The job became obsolete with the arrival of electricity in the Philippines. In 1890, Thomas-Houston Electric Company installed the first electric street lights along Luneta. To establish order in the community, the pre-colonial chieftain of a barangay was compelled to enact laws. With the approval of the village elders, these new laws would then be publicly announced by an umalohokan, the ancient counterpart of today’s broadcaster. There used to be itinerant engravers with their small jeweler’s chisels and hammers who offered engraving and etching services to identify family tableware. 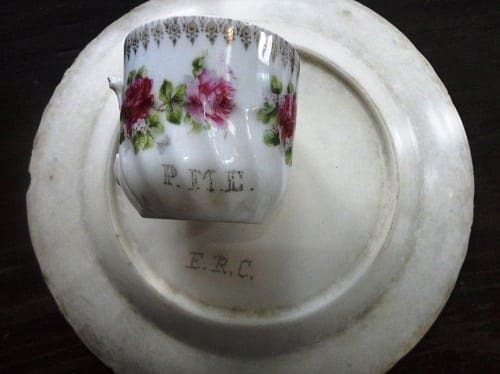 Precious porcelain plates, enamelware, cups, crystals, saucers, spoon, forks and silver cutlery were etched or engraved with the monogram or initials of the owner, by pounding “dots” to form individual letters. A pair of steady and controlled hands is needed to perform the delicate process, lest damage is done on valuable china. Today, engraving is done by machine, sometimes even done free by commercial shops, rendering manual engraving service obsolete. 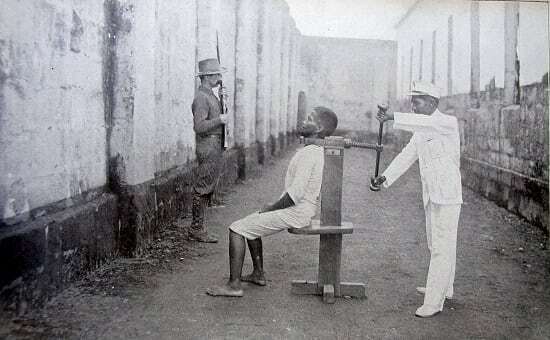 Execution chamber and garrote, Manila, 1899. By C. H. Graves. 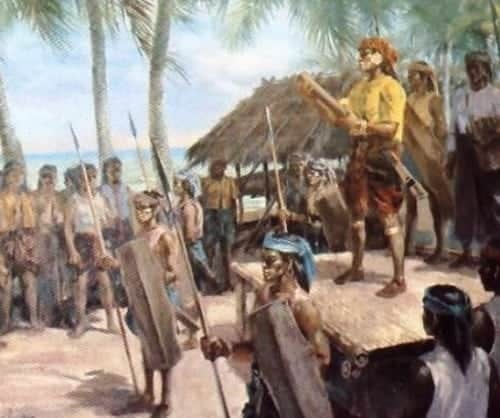 The Spanish colonizers brought to the country several methods of capital punishment. Criminals and convicted enemies of the government suffered death through hanging, shooting, burning, and decapitation, just to name a few. Also among these methods was the garrote, which became so notorious not only for killing the martyr priests GOMBURZA but also because people think it involved a slow, painful death by strangulation. However, nothing could be further from the truth, especially if you’ll read the eyewitness account by Joseph Earle Stevens. In 1898, his memoir entitled “Yesterdays in the Philippines” was published and inside it is a rare personal account of a garrote execution he witnessed in Manila on July 4, 1895. Garrote execution in Manila on July 4, 1895, witnessed and photographed by Joseph Earle Stevens (author, “Yesterdays in the Philippines”). Driven by scientific curiosity, Stevens joined many others in viewing the garrote execution of two native Filipino boys, aged 20 and 22, who were sentenced to death after robbing and butchering their Spanish master. 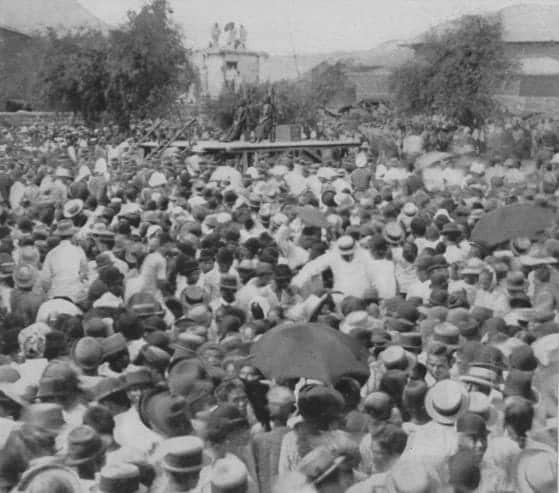 The execution was supposed to be done behind Luneta, but public protest prompted then Governor General Blanco to move the place of execution somewhere near the Manila slaughterhouse. 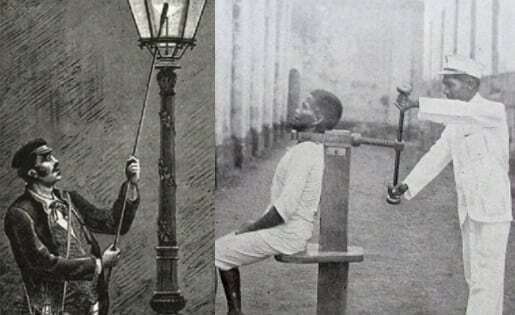 When the Americans took over the Philippines at the dawn of the 20th century, they chose to keep garrote as a method of execution. It was abolished in 1902. Editor’s note: The practice of peddling milk still persists in a few rural markets, but nowadays, hard-to-find carabao’s milk is packaged in ketchup bottles. 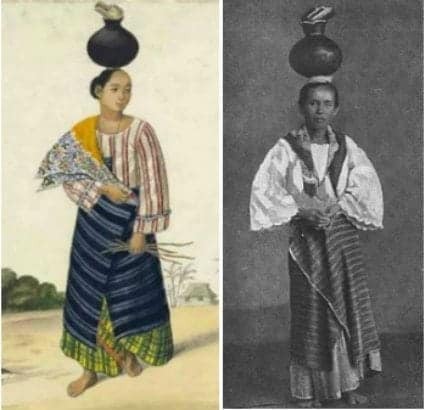 In the days of yore, ambulant milk vendors or lecheros/lecheras plied the town streets with their fresh gatas kalabaw (carabao’s milk) dispensed from metal pitchers, earthenware crocks or from dried gourds. A milkmaid “accepts monthly payments, and only in very special cases will ask for advanced payments.” She usually carries an earthen jar on her head because “she is not used to carrying an umbrella, nor would she use it without running the risk of ruining her merchandise.” The said jar was half-covered so as to prevent the milk from getting sour. A chupa was also placed at the jar’s mouth which the milkmaid used for measuring. 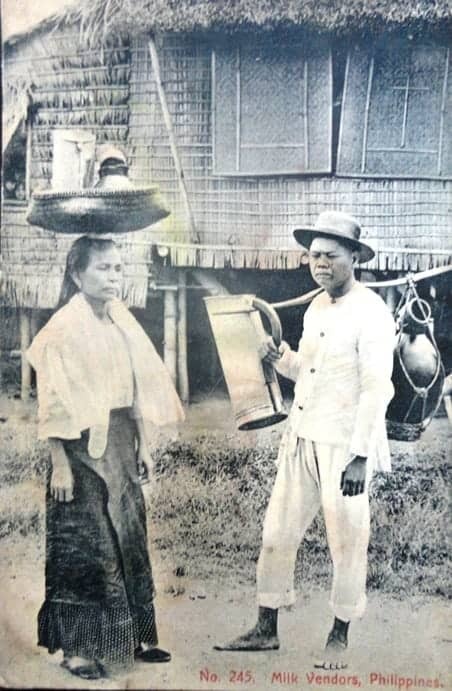 19th century lecheras (milkmaid) in Manila. By 1878, Filipinos could contract La Perla Oceano, located at 23 Crespo Street in Quiapo, to deliver daily supply of fresh carabao milk to their homes. Others still preferred to get their milk from independent lecheros/lecheras who would station themselves strategically near the public market while others would line the main road. By mid-morning, their milk-selling duties would be over. Editor’s note: Young and older adults still offer shoe-shining service in some parts of the country, particularly in Baguio City. However, “shoeshine boys” (emphasis on the age) are basically non-existent. 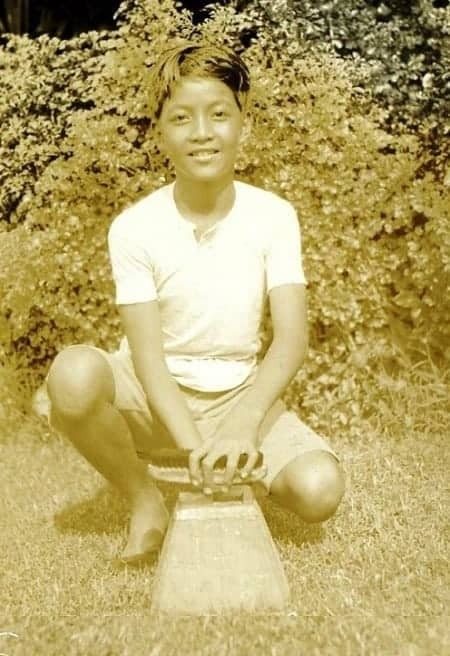 Back in the 1930s through the 1960s, Filipino street boys could earn an honest living by shining shoes, thanks to the invention of the shoe polish in the early 20th century. Limpia botas, or bootblacks, with their homemade shoe cleaning kit that included brushes, “biton” (shoe polish wax) and dyes, and pieces of rags for buffing leather shoes. The handle of the kit doubles as a shoe rest, so the limpia botas could work on the shoes from all angles. As late as the 1990’s, shoeshine boys could be seen in the city’s commercial areas like Ermita, where tourists and office workers are concentrated. As shoe shining consumed more time, boys gave it up for quicker money-making jobs—watch-your-car, parking aide, and vending among others. Besides, customers began favoring shoe service shops that offered all-in-one shoe shining, and general repair. From: “Zarzuela,” Chronicle Magazine, 1963. The zarzuela (sarsuela) is a theatrical play from one to five acts that features singing and dancing. It was adapted from Spain and by the 1900s, sarsuelas were being staged in Manila and in provinces like Ilocos, Pampanga, Cebu and Iloilo. Mounting such elaborate musical operettas involved people working behind the scenes—from the maestro del coro (choirmaster), telon (curtain) raiser to the prompter, or apuntador—in case the actor forgets the lyrics of the song or misses a cue to exit. 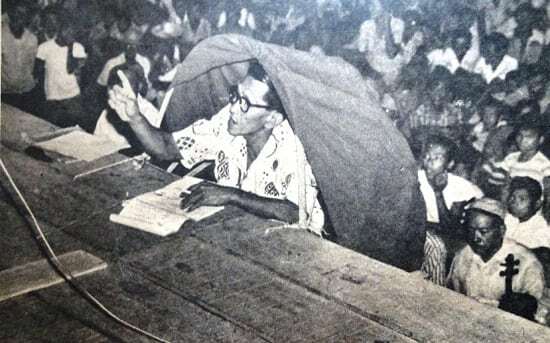 With a script in hand, the apuntador coaches in front of a covered portion of the stage, using a “concha” or a conch shell to direct his voice discreetly to feed an actor his lines. Zarzuelas are rarely staged these days, and prompters have become optional, with such modern-day stage aids like teleprompters and earphones. A scene from the 2000 film “Lagarista” starring Piolo Pascual. Before digital films, movies were shot on rolls of film acetate, from which a number of prints were made. Since these were limited in number, a movie house courier had to pick up and deliver film prints rolled in circular cans to other movie houses in the city according to each cinema’s showing schedule. 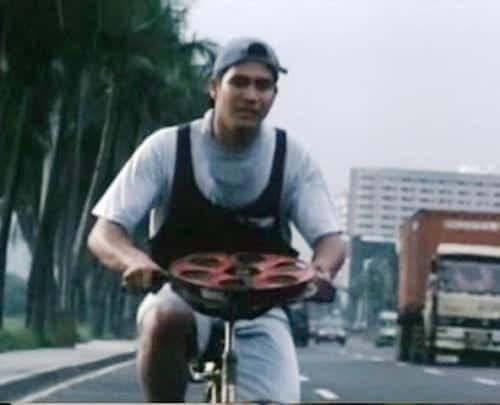 Called “lagaristas” (from “lagare,” a carpenter saw, a slang for someone who goes back and forth, from one job to another), they usually ride on bikes so they can quickly navigate the city roads to ensure timely delivery of the film rolls, in all kinds of weather. Technology has made it possible to shoot films on a digital format, that could be stored in mediums such as a memory card or CDs. These can be reproduced cheaply and distributed easily, for showing in cinemas. 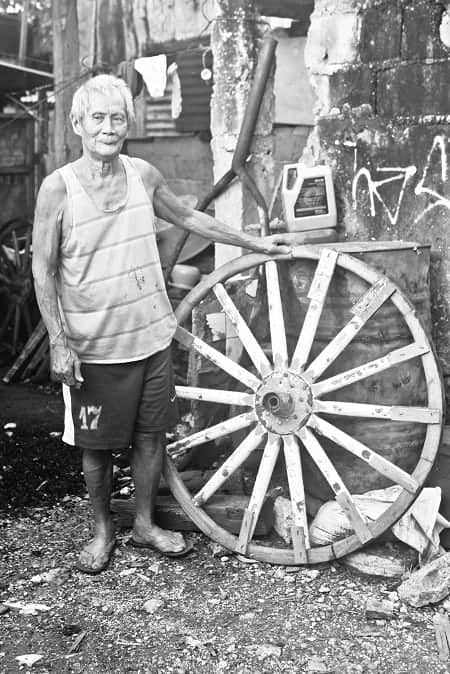 Gareta/Kalesa Wheelwrights (Wooden wheel makers). Wheelwrights—maker of wooden wheels—were essential in every rural town that depended on carts with wooden wheels to transport their produce. They not only made solid hardwood wheels ringed with iron, but also built wheels for kalesas, carriages and carrozas. The advent of rubber tires, first made in the mid-1800s caused the disappearance of wooden wheels as well as the wheelwright trade. They rolled quieter, moved smoother as they had more traction, and were longer-lasting. Today, only a handful of wheelwrights are in operations to service kalesas that are still in existence in some parts of the country. Early Filipino musicians discovered that the hollow bamboo could be made into a musical instrument— a flute, an angklung, a tuba, a clarinet, or even a xylophone. 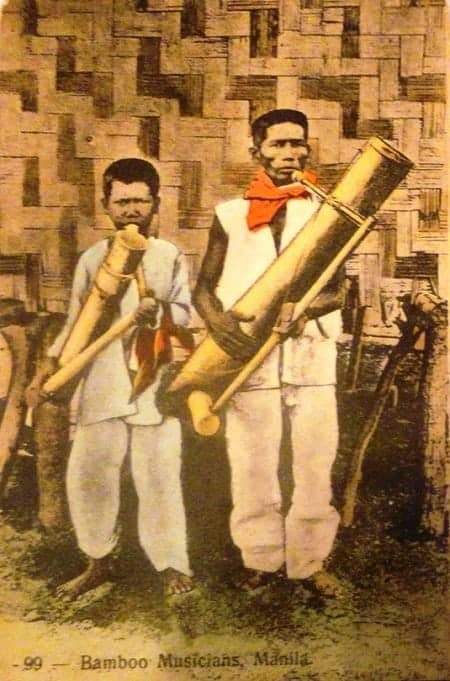 In the 19th century, small band musicians would often make the rounds of town fiestas to make a few centavos by playing these improvised bamboo instruments. Soon, a whole ensemble of bamboo musicians were organized into bands like the legendary “Banda de Boca” of Malabon, that began in the 1890s and which comprised of katipunero-musicians. Although bamboo was readily available even to poor musicians, it was subject to cracking and insect infestation. Metal instruments found favor over these hand-made bumbong music makers, leading to the exit of these bamboo-carrying troubadors. Agoncillo, T. (1990). History of the Filipino People (8th ed., p. 44). Quezon City: C & E Publishing, Inc.
Fernando, G. & Ricio, N. (1978). Turn of the Century (p. 108). GFC Books. Sta. Maria, F. (1983). Household antiques & heirlooms (p. 80). GCF Books. Sta. Maria, F. (2006). The Governor General’s Kitchen: Philippine Culinary Vignettes and Period Recipes 1521-1935. Mandaluyong City: Anvil Publishing, Inc.
Stevens, J. (1898). Yesterdays in the Philippines. Scribner. Pingback:Here Are 9 Jobs You Didn't Know Existed In The Philippines! READ HERE!